Rotherham-based Gala Tent has won a national award for its new online payment system which aims to protect customers from fraudulent telephone transactions. One the UK's largest importer and exporter of tents, marquees and pop up awnings, Gala Tent launched the system six months ago and has recently won the award for Security Innovation of the Year at the 2014 UK IT Industry Awards run by BCS, The Chartered Institute for IT, and Computing, beating a host of high profile IT companies including BT, Firehost and Random Storm. The system, which is the brainchild of company founder and managing director Jason Mace, has prevented 100% of fraudulent phone transfers since it was implemented in 2012. The Manvers-based team developed the system in-house which allows orders to be taken over the phone confidently and safely, meaning that consumers are at a lower risk of their cards being used fraudulently. It works by allowing the customer to complete payment processes online, using a unique reference number and URL provided by the telephone sales representative. Confirmation that the payment has passed security checks is then sent back to the secure server, where it is stored anonymously along with the reference number and the telephone sales representative is then able to confirm that payment has been authorised. 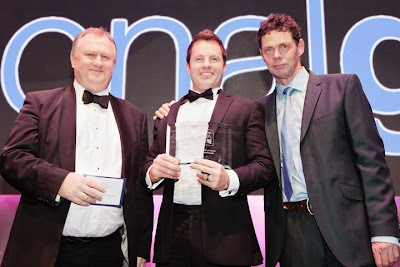 Jason Mace, founder of Gala Tent (pictured, centre), said: "I am overwhelmed with the award; the UK IT Industry Awards are rigorously judged and truly celebrate innovation and best practice in IT today. To emerge as a winner in such a highly competitive industry is excellent. "Telephone transactions are still 70% of business in Britain but the IT industry has ignored development in tackling telephone order fraud to date. The Secure Order Transfer system was set up in-house to combat this issue and now we have the attention of some of the largest players in the security sector. It's an amazing achievement and a huge step forward for fraud prevention from telephone orders." Mace adds that because Gala Tent is not a specialist IT company, he would consider selling the patent Secure Order Transfer technology to further its development. VISA and MasterCard are among the businesses who have already expressed a desire to implement the system while interest to acquire the business, which has been valued at £50m by HSBC, has also been registered.